Don’t be confused by the name: Alaska Airlines isn’t just for flights to and from Alaska. Or just the West Coast. It offers 1,200 daily flights to more than 115 destinations throughout North America and Costa Rica. One of the best ways for travel-hungry consumers to maximize the Alaska Airlines frequent flyer program, Mileage Plan, is to book flights with its international partners using Alaska Airlines miles. For example, Mileage Plan members can fly business class from the U.S. to Asia on partner airline Cathay Pacific for 50,000 points one-way. In fact, it’s a good time to be in, or join, the Mileage Plan program if you are short on miles and are facing a hefty price tag on a necessary trip. In a promotion ending July 13, Alaska Airlines is offering up to a 40% bonus when buying Mileage Plan miles. With this promotion, you could purchase 72,000 miles for a total of $2,128.50 to get 100,000 miles, which would cover, for example, the miles requirement for a round trip from New York to Hong Kong on Cathay Pacific in business class. Google Flights prices that trip at $7,845. Buying Mileage Plan miles during the 40% bonus promotion allows you save roughly 70% of that retail ticket price. 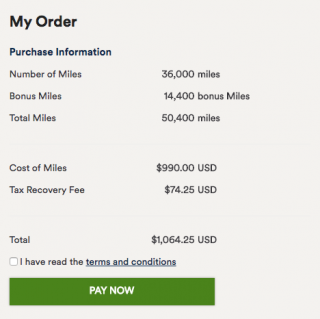 You’ll need to make two purchases of 36,000 miles, as shown in this screenshot. Have you scored a great travel deal lately?